Rodman is the author of Mass Media in a Changing World. For cheap and affordable prices you can get a pre-owned copy of this text book from Valore Books today. Make sure you have the opportunity to rent Mass Media in a Changing World online too if you wish. It can save you money if you want it for a semester or for a quarter. Published by McGraw-Hill in 2011, this is the 4th edition of the book to be issued. 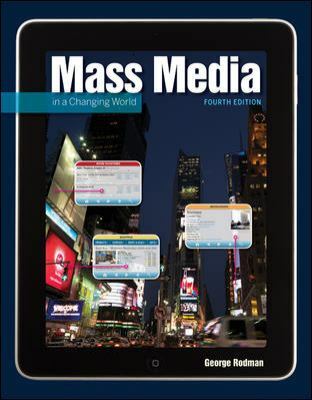 Make sure you have an up to date copy of the used Mass Media in a Changing World book. Rodman is the author of 'Mass Media in a Changing World', published 2011 under ISBN 9780073512013 and ISBN 007351201X. Loading marketplace prices 46 copies from $8.93 How does the rental process work?